If you love a classic look and equestrian flare, Christmas gifts are a great place to show off this style. 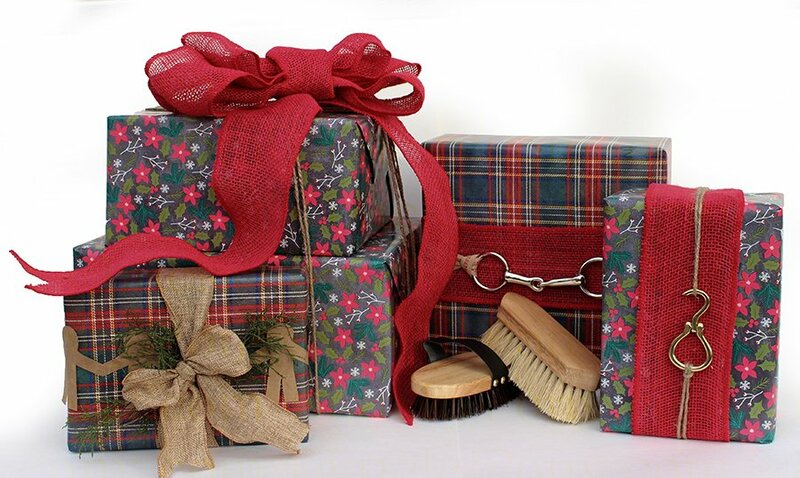 Small pieces of equestrian hardware can take the place of a bow to create sophisticated wrapping for your gifts. This year, I raided LuckyPony.com’s hardware department to wrap gifts for my family and friends. 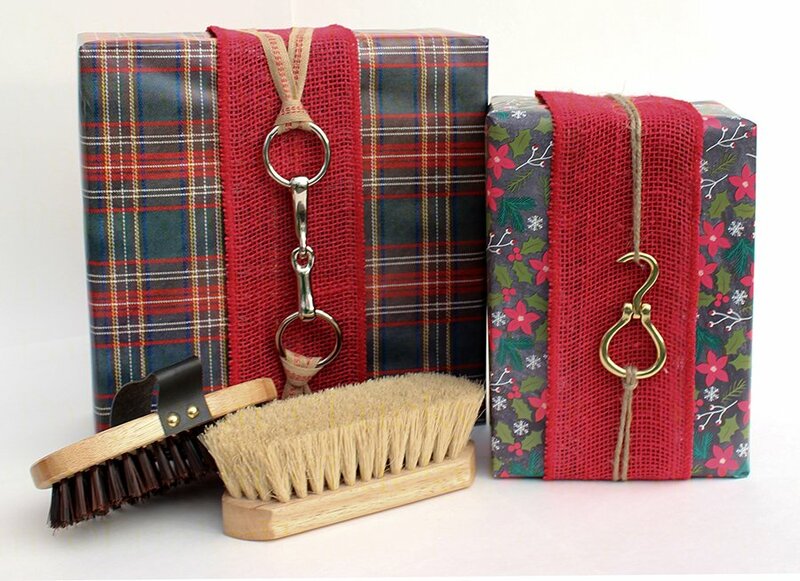 In this article I’ll outline a few specific ideas for equestrian themed wrapping, as well as where you can find the needed materials. I suspect these awesome little hoofpicks are as commonly used for decoration as often as they are used as actual hook picks! Popular as belt buckles, these folding brass hoof picks make perfect small elements to decorate a package. You can use a standard snaffle bit, although for most package the heft of a full size bit can dwarf a package. For my package I used a miniature horse snaffle bit, sized just right for an average 10-12″ long package, and light enough that it was easy to tie with a thick ribbon. 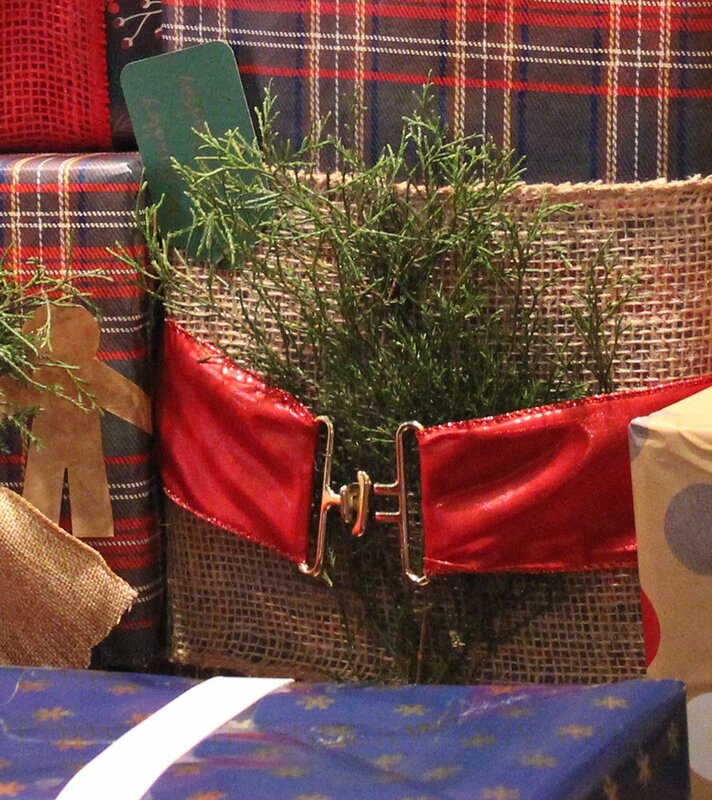 For both the bit and the hoof pick present, I chose a patterned wrapping paper in traditional colors, encircled with a wide band of bound-edged burlap ribbon, and then secured the decoration with a bit of jute twine for the hoof pick and a brown burlap trim with red ticking for the bit package. Using small equestrian elements like bits or hoof picks is not only decorative, but also useful. A horse owner can never have too many hoof picks, and a horse bit, even one too small for average horses, can be used many decorative ways, which I’ve blogged about before. 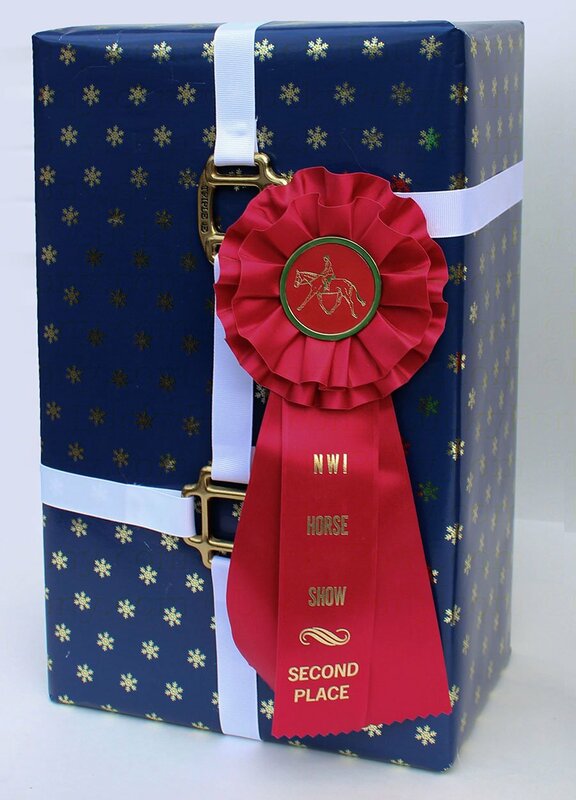 A simple surcingle buckle is an inexpensive and unique way to add equestrian style to ribbons on a package. 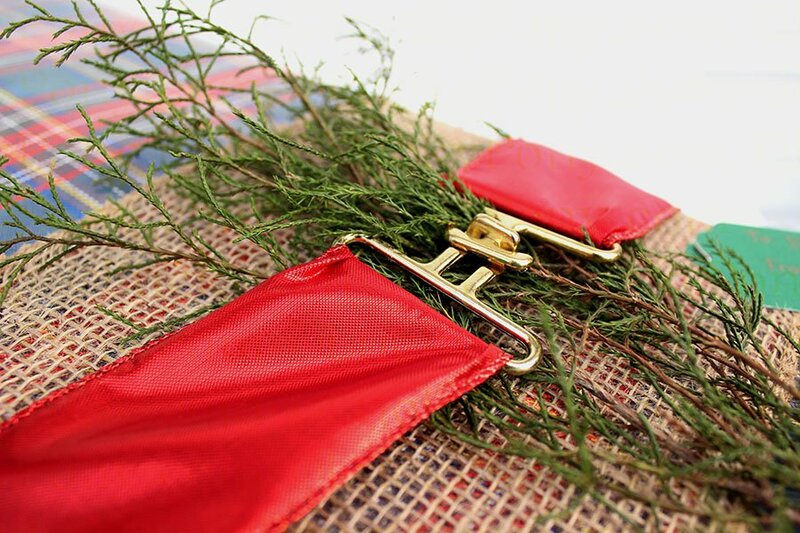 For this package, 2 inch wide ribbon is paired with a brass surcingle buckle to create a cute way to secure an evergreen sprig to the front of a gift. Loose halter hardware and horse show ribbons can be used together, as pictured here, or separately to create stylish equestrian gifts. Both the halter hardware (this particular part is called a “halter square”) and generic horse show ribbons can be purchased at LuckyPony.com. These are just 5 ways I came up with to work equestrian elements into my gift wrapped packages this Christmas. Did this inspire you, or do you have more ideas to share? Let me know via the comments below- I’d love to see how these ideas worked with different papers and textiles or how my wrapping inspired totally new ideas on equestrian wrapping.